On April 5 and 6, 15 teams from throughout the ACC will compete against one another in the inaugural ACC InVenture Prize, hosted by Tech and modeled after its own competition. In a “Shark Tank”-like pitch competition, each team of undergraduates will pitch their ideas in front of a live audience and a panel of judges, in hopes of grabbing some of the $30,000 in prizes. As a collaborative effort between ACC institutional leadership, the competition will celebrate the creativity and ingenuity of all Atlantic Coast Conference schools, inspiring entrepreneurial activity among all students. 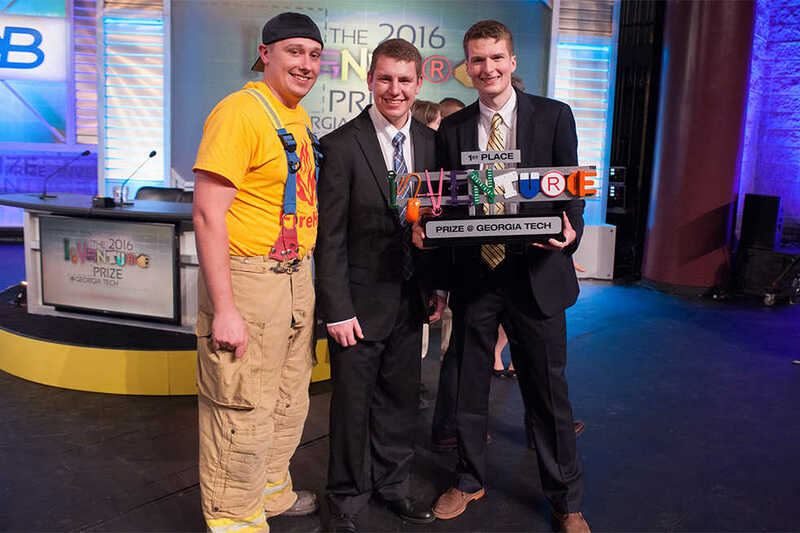 Representing Tech in the competition are the first place winners of Tech’s own InVenture Prize: Zack Braun and Tyler Sisk with FireHUD, a display and data monitor that tracks and displays real-time information to firefighters in hazardous conditions. FireHUD will compete against 15 winners of similar contests. Among the other competitors are Clemson’s Schlageter Packaging, an environmentally friendly packaging material to replace Styrofoam; Virginia Tech’s Yard Mapper, a Bluetooth system used to track semi-truck trailers at distribution centers; and UVA’s Contraline, a reversible and injectable male contraceptive that can last for several years. Other inventions competing at the ACC level include Syracuse’s PowerSpike, an online marketplace connecting sports streamers with sponsors, and Lousiville’s E-Bike, an electric bicycle powered by solar energy. Each team will be judged on four criteria: entrepreneurship, business model, quality of the idea, and the probability of becoming a successful business. The first place winner will receive $15,000. Second place will win $10,000. The People’s Choice winner, determined by online and text voting, will win $5,000. The competition will take place in the Ferst Center on 8 p.m. on April 6 and will be broadcast live by Georgia Public Broadcasting.